1919 - Treaty of Versailles - Japan was granted a mandate over the ex-German islands in the Pacific. 1927 - Geneva Naval Conference failed to reach agreement on total tonnage of cruisers, destroyers and submarines. Major warships completed included US carriers "Lexington" and "Saratoga", Japanese carrier "Akagi". 1930 - London Naval Treaty - Britain, US and Japan agreed on total tonnage, tonnage and armament limitations for cruisers, destroyers and submarines. Also that no new capital ships were to be laid down until 1937. 1931 - An incident in the Chinese province of Manchuria led to the Japanese invasion which was completed by early 1932. The puppet state of Manchukuo was declared. By then Japanese forces had taken control of the Shanghai area in further fighting. 1933 - Japanese walked out of the League of Nations over the Manchurian issue. Major warships completed included Japanese carrier "Ryujo". 1934 - The 1932 Geneva Disarmament Conference finally broke down and Japan announced its intention to withdraw from the 1922 and 1930 Naval Treaties when they expired in 1936. Planning started on the giant battleships of the "Yamato" class. Major warships completed included US carrier "Ranger"
1935 April - The United States passed the Neutrality Act forbidding the supply of arms to belligerents in the event of war. 1936 November - London Protocol -The major powers including Germany agreed to prohibit unrestricted submarine warfare against unarmed ships. December - The 1922 and 1930 Naval Treaties were allowed to lapse and the major powers moved towards rearmament. 1937 July - Further incidents in China this time near Peking, led to Japan extending its hold over northeastern China. Major warships completed included US carrier "Yorktown", Japanese carrier "Soryu". 1938 - By the end of 1938, Japan had completed its hold over northeastern China and the major port areas. Major warships completed included US carrier "Enterprise". 1939 September 1st - Germany invaded Poland; 3rd - Britain and France declared war on Germany. Major warships completed to 3rd September 1939 included Japanese carrier "Hiryu". Launched in the same period - US carrier "Wasp", Japanese carrier "Shokaku"
Steps to War with Japan - Japan established a Chinese puppet-government in Nanking. Italy Declares War - Italy declared war on Britain and France on the 10th. Two weeks later France was out of the war. Still on the 10th, Australia, Canada, India, New Zealand and South Africa declared war on Italy. Steps to War with Japan, June/July - With its possession of the Chinese ports, Japan wanted to close the remaining entry points into China. Pressure was put on France to stop the flow of supplies through Indochina, and on Britain to do the same with the Burma Road. Both complied, but Britain did so only until October 1940, when the road was reopened. Axis Powers - Germany, Italy and Japan signed the Tripartite Pact in Berlin on the 27th. They agreed to jointly oppose any country joining the Allies at war - by which they meant the United States. Steps to War with Japan - Vichy France finally agreed to the stationing of Japanese troops in northern Indochina. Fleet Air Arm Attack on Taranto - On the 11th in the Mediterranean, British carrier "Illustrious" launched a Swordfish torpedo biplane attack on the main Italian naval base. Of the six battleships present, the 20 aircraft hit "CONTE DI CAVOUR" and "CAIO DIULIO" with one torpedo each and the brand new "LITTORIA" with three. All three sank at their moorings and "Cavour" was never recommissioned, all for the loss of just two Swordfish. 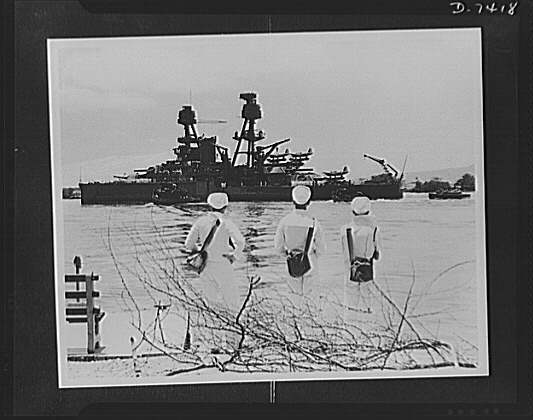 The Japanese Navy studied the attack carefully as Pearl Harbor learnt to its cost just a year later. Steps to War with Japan - Five Year Neutrality Pact between Japan and Russia benefited both powers. Russia could free troops for Europe and Japan concentrate on her expansion southwards. The demand for bases in southern Indochina was now conceded by Vichy France. Britain, Holland and the United States protested and froze Japanese assets, but the troops went in. The Dutch East lndies cancelled oil delivery arrangements and the Americans shortly imposed their own oil embargo. Japan had lost most of its sources of oil. Japan and the US continued to negotiate over their differences, but as its oil stocks rapidly declined Japan accelerated preparations for war. War Minister Gen Tojo became Japanese Prime Minister. 3rd - The recently completed British fleet carrier "Indomitable" ran aground and was damaged off Kingston, Jamaica. She was due to accompany capital ships "Prince of Wales" and "Repulse" to the Far East as a deterrent to Japanese aggression. Her absence in December may have proved fatal to the two big ships. Steps to War with Japan - As talks dragged on and the United States demanded the departure of Japan from China as well as French Indochina, the Pearl Harbor Strike Force sailed into the North Pacific. Vice-Adm Nagumo commanded the fleet carriers "Akagi", "Hiryu", "Kaga", "Soryu", "Shokaku" and "Zuikaku", plus two battleships, cruisers and destroyers. Britain's limited naval deterrent to Japanese expansion, capital ships "Prince of Wales" and "Repulse" met at Colombo, Ceylon on the 28th, en route to Singapore. Without the fleet carrier "Indomitable" they had no ship-borne aircraft support. United States - Apart from the defence of its Western seaboard, Panama Canal Zone, Alaska and the Aleutians, Hawaiian Islands and various islands in the Central Pacific, the US had responsibilities towards the Philippines. In the event of attack, the defenders were expected to hold out until relieved by the US Pacific Fleet fighting its way from the main base at Pearl Harbor, a distance of 4,500 miles. In the Philippines was the Asiatic Fleet with three cruisers, 13 destroyers and 29 submarines. The Pacific Fleet itself consisted of eight battleships, three fleet carriers, 21 cruisers, 67 destroyers and 27 submarines. Britain and Dominions - Responsible for defending India, Ceylon, Burma, Malaya, northern Borneo, Hong Kong, Australia, New Zealand, the Papua New Guinea/Bismarck Archipelago/Solomon Islands chain, and numerous island groups throughout the Indian Ocean and Central and South Pacific. Few forces could be spared from existing war zones to protect this vast spread of territory and its supply routes. Britain's main base was at Singapore with its two recently arrived big ships. Three old cruisers and some destroyers were in Malayan waters, and a few old destroyers at Hong Kong. By now the surviving seven cruisers and smaller ships of the Royal Australian and New Zealand Navies were back in the region. Dutch - Naval forces allocated to the defence of the many islands of the Dutch East lndies included three cruisers, seven destroyers and fifteen submarines. Southeast - landings in north New Guinea, the Bismarck Archipelago and northern Solomons would protect the Japanese Carolines. From there, forces could strike Australia and its supply routes. Westwards - From Indochina to northern Borneo, and later direct to Sumatra and Java. Eastwards - From bases in Formosa and the Carolines to the Philippines. From there to southern Borneo, Celebes and Moluccas, and on to Timor and Bali. Then to eastern Java. Only when Japan sought to extend the southeast and eastern perimeters - at Guadalcanal and Midway Island respectively in mid-1942 did it suffer the first defeats. America's growing power would then make Allied victory inevitable. The Imperial Japanese Navy had far more carriers, its surface task forces were well trained, especially in night-fighting, and they had no command or language difficulties. They also introduced the Allies to a secret and powerful weapon in the 24in Long lance torpedo. In contrast, the Allied ships were scattered and had no central command. Their main bases at Singapore and Pearl Harbor were 6,000 miles apart, and most of the strength was concentrated with the US Pacific Fleet. For its conquests, the Japanese Army fielded only slightly more troops, but these were usually better trained, and also experienced in amphibious operations. They had air superiority both overall and locally. Only the US Pacific Fleet posed an immediate danger to Japanese plans. Hence the decision to attack it in Pearl Harbor rather than wait for it to try to fight through to the Philippines. The Japanese chose the time and place of their landings, all well escorted by cruiser and destroyer forces. Air cover was maintained by land-based aircraft or from carriers and seaplane carriers as necessary, and battleships and cruisers provided distant support. By this time the annihilation of the Allied capital ships would make their presence unnecessary. The few Allied maritime sorties - some surface, but mainly by aircraft and submarine - had few successes against the invasion fleets. And in return they suffered heavy losses. Declarations and Outbreak of War - Because of the International Dateline, events that took place on the 7th in Hawaii as far as Washington and London were concerned, were already into the 8th in Hong Kong and Malaya. By the 8th: (1) Japan had declared war on Britain and the US; (2) Britain, Australia, Canada, New Zealand, South Africa, Holland, the United States and a number of Central American and Caribbean states had declared against Japan; and (3) China declared war against the Axis powers. South - Northern Borneo and Philippines Islands - The first landings in northern Borneo took place in Sarawak and Brunei on the 16th December, and continued through until late January 1942. In the Philippines, the island of Luzon was the main target. Between the 10th and 22nd, landings were made in the north of the island, in the south, and at Lingayen Gulf in the west. The Japanese forces made a combined drive on the capital of Manila, which was declared an open city. They entered on 2nd January 1942 by which time preparations were being made to attack Gen MacArthur's US and Filipino troops now withdrawn into the Bataan Peninsular just to the west of Manila. The southern island of Mindanao was invaded on 20th December 1941. East - Hawaiian Islands, Guam, Wake Island and British Gilbert Islands - On the morning of the 7th local time (shortly after the Malay landings) the Japanese Strike Force aircraft hit Pearl Harbor on the Hawaiian island of Oahu. In the Attack on Pearl Harbor, battleships “ARIZONA” and “OKLAHOMA” were total losses, three more sank but were later re-commissioned, and the remaining three damaged. Many were killed and a considerable number of aircraft destroyed. Although the Pacific battlefleet ceased to exist, the three priceless fleet carriers “Enterprise”, “Lexington” and “Saratoga” were fortunately absent and the large oil stocks and important repair installations left virtually untouched. By the 10th, Guam in the Mariana Islands was captured and Makin and Tarawa in the British Gilberts occupied. Tarawa was then abandoned until the following September 1942. Wake Island was attacked on the 11th December, but the Japanese were driven off with the loss of two destroyers by the US Marine defenders. A later attempt on the 23rd succeeded. Allied Command - Early in the month, British Gen Wavell was appointed to command ABDA (American, British, Dutch, Australian) forces responsible for holding Malaya and the Dutch East Indies. South - Philippines and Dutch East lndies - As the US and Filipinos were slowly pushed into Bataan, the Japanese began the invasion of the Dutch East lndies from southern Philippines. First landings took place on the 11th at Tarakan in Borneo and in the Celebes. More followed later in the month, but which time they had reached the Moluccas in the drive south towards Java. 20th - Submarine "I-124" minelaying off Darwin, northern Australia, was sunk by Australian minesweepers "Deloraine", "Katoomba", "Lithgow" and US destroyer "Edsall". Southeast - Bismark Archipelago - The first Japanese move towards the southeast took place on the 23rd with landings at Kavieng, New Ireland and Rabaul, New Britain. Rabaul became the major Japanese base in the South West Pacific and helped dictate the whole strategy of Allied moves in the next two years. South - Dutch East lndies - The two-pronged advance on Java continued with airborne landings on Palembang in southern Sumatra on the 14th, followed up by landings from the sea one day later by forces carried from Indochina. A few days later the islands of Bali and Timor were invaded from the Celebes and Moluccas respectively. The scene was set for the conquest of Java. Battles of the Java Sea - ABDA's main naval force was commanded by the Dutch Adm Doorman and consisted of a mixed squadron of cruisers and destroyers for the defence of Java: heavy cruisers "Exeter" and the US "Houston", light cruisers "Perth" (Australian), "De Ruyter" and Java" (both Dutch), destroyers "Electra", "Encounter", "Jupiter", plus two Dutch and four American. They put to sea on the 26th on the news that invasion convoys were approaching. Failing to find them they headed back to Surabaya the next day, but before getting in, more reports arrived and the Allied force went out again towards a position to the northwest. The main battle started on the 27th at around 16.00 against the two heavy, two light cruisers and 14 destroyers covering the Japanese transports. Both Allied heavies opened fire at long range, but "Exeter" was soon hit and her speed reduced. In the resulting confusion one of the Dutch destroyers was torpedoed and sunk. As "Exeter" returned to Surabaya with the second Dutch destroyer, the Royal Navy destroyers went in to attack and "ELECTRA" was sunk by gunfire. Adm Doorman headed back south towards the Java coast and sent off the US destroyers to refuel. He then turned to the north with his remaining four cruisers and two British destroyers. By now it was late evening and "JUPITER" was lost probably on a Dutch mine. "Encounter" picked up survivors from the first Dutch destroyer and shortly followed the Americans to Surabaya. The four cruisers, now without any destroyers, were in action sometime before midnight and both "DE RUYTER" and "JAVA" were blasted apart by the big Japanese torpedoes. "Perth" and "Houston" made for Batavia, further west along the north coast of Java. The next evening, on the 28th, "Perth" and "Houston" left Batavia and sailed west for the Sunda Strait to break through to the Indian Ocean. From Surabaya three of the US destroyers went east and eventually reached safety through the shallow Bali Strait. "Exeter's" draught was too great for this route and the damaged cruiser had to make for the Sunda Strait accompanied by destroyer "Encounter" and US destroyer "Pope. " BattIe of the Sunda Strait - Late that evening "PERTH" and "HOUSTON" ran into the Japanese invasion fleet in the Strait and attacked the transports. They were soon overwhelmed by the gunfire and torpedoes of the covering cruisers and destroyers, and sank in the opening minutes of the 1st March. A Dutch destroyer following astern suffered the same fate. Later on the morning of the 1st March "EXETER", "ENCOUNTER" and "POPE" fought a lengthy action with a cruiser force to the northwest of Surabaya before they too succumbed. Of the entire Allied force in the Java Sea, only three old US destroyers managed to get away. Australia - Aircraft from four of the Pearl Harbor Strike carriers raided Darwin, Northern Territories on the 19th. One American destroyer and a number of valuable transports were lost. South West Pacific - The ANZAC Squadron was formed in the South West Pacific from Australian cruisers "Australia", "Canberra" and old light cruiser "Adelaide", New Zealand light cruisers "Achilles" and "Leander", and the American "Chicago". South - Philippines and Dutch East lndies - As the US and Filipinos struggled to hold on to Bataan, Gen MacArthur was ordered to leave for Australia. There he assumed the post of Supreme Commander, South West Pacific. US Adm Nimitz was to command the rest of the Pacific. The Java landings went ahead on the 1st and Batavia, the capital of all the DEI, fell. The Allied surrender was agreed on the 9th. On the 12th, northern Sumatra was occupied and the rest of March spent consolidating the Japanese hold throughout the many islands. Japan's southern perimeter had been secured in less than four months. South East - Bismarck Archipelago, New Guinea, British Solomons Islands - The Bismarck Sea was secured with two series of landings. To the north the Japanese took Manus and other parts of the Admiralty Islands. In northern New Guinea, they landed in the Huon Peninsula at Lae, Salamaua and Finschhafen. When they occupied the northern island of Bougainville, the scene was set for the fierce Solomons Islands battles to come. Philippines - Conclusion - Japanese units made their final push on Bataan and on the 9th, the Americans and Filipinos surrendered. The island fortress of Corregidor held out until the 6th May. Some resistance continued on other Philippines islands. The infamous "Bataan March" of American and Filipino POW's followed. The Doolittle Raid - American B-25 bombers under the command of Col Doolittle took off from US carrier "Hornet" for the first ever raid on Japan on the 18th. Damage was slight, but the strategic implications were to prove fatal to the Japanese. To the west and south the Japanese had secured their perimeter to plan. They would also do so in the southwest as the British, together with the Chinese in the northeast, were steadily driven out of Burma. The debate was now whether or not to push out to the southeast towards Australia and New Zealand, and eastwards to the United States. * 6 battleships sunk at their moorings or damaged. Now it was the Allies' turn to establish a defence perimeter running from the Hawaiian Islands around to Australia and New Zealand. With most of the ANZAC forces in North Africa, it was left to the Americans to garrison many of the islands needed to protect the supply routes from the US to the two Dominions. By now they were occupying the Line Islands south of Hawaii as well as Samoa, Tonga, New Hebrides and New Caledonia. The Australians were reinforcing Port Moresby in Papua New Guinea and New Zealanders landing in Fiji. The "Doolittle Raid" made a decisive impact on Japanese strategy. The Allies had to be kept away from the homeland. Japanese conquests would be extended both to the southeast and east. Landings would be made at Port Moresby to bring Australia within bomber range, the southern Solomons and beyond would be taken to cut US-Australia supply lines, and Midway Island and the Aleutians occupied to isolate Pearl Harbor. Each of these three moves led to three famous battles - (1) Coral Sea, (2) Guadalcanal, and (3) Midway, each one a step-too-far. Thereafter the Japanese would be on the defensive. Papua New Guinea and British Solomon Islands - Sailing from Rabaul, a Japanese invasion force headed for Port Moresby, Papua New Guinea covered by light carrier "Shoho" and cruisers. Distant cover was given by a carrier strike force of two fleet carriers. From the Coral Sea, aircraft of US carriers "Lexington" and "Yorktown", with a support group including Australian cruisers "Australia" and "Hobart" searched for them. First success in the Battle of the Coral Sea (step-too-far 1) went to the Americans on the 7th when their planes sank "SHOHO" off the eastern tip of New Guinea. Next day, on the 8th, more aircraft strikes put fleet carrier "Shokaku" out of action on one side and sank "LEXINGTON" and damage "Yorktown" on the other. A draw in naval terms, the battle was a strategic defeat for the Japanese as the invasion ships turned back, leaving Port Moresby, so close to the north tip of Australia, safe for now. Throughout the battle, neither side's ships sighted each other - the first time in naval history a major action had taken place in this way. Before the battle started, the Japanese took the opportunity to occupy a small island called Tulagi in the southern Solomons, close to a larger island known as Guadalcanal. Midway and the Aleutians - Adm Yamamoto, with over 130 ships in a number of separate groups, set out to seize Midway island, occupy the western Aleutians, attack the eastern end, and draw out the Pacific Fleet for destruction. At the heart of the armada was the First Carrier Fleet (Adm Nagumo) with four of the Pearl Harbor attack carriers. The Americans had far fewer ships, but these included carriers "Enterprise", "Hornet" and "Yorktown" barely repaired after the Battle of the Coral Sea. Battle of Midway (step-too-far 2) - On the 3rd, Dutch Harbor, close to Alaska, was attacked from two light carriers. But the main battle was far to the south off Midway between the carrier aircraft of both sides. On the 4th/5th in the close run battle, all four Japanese carriers - "AKAGI", "HIRYU", "KAGA" and "SORYU" went down. "YORKTOWN" was badly damaged and finished off by a Japanese submarine on the 7th. The Japanese forces retreated, Midway was spared, and the Allies had their first major strategic victory of World War 2. However, the Japanese Navy remained strong, with more carriers in the Pacific than the Americans. The occupation at this time of Attu and Kiska in the Aleutians was of little consequence. Australia & New Zealand - The US Pacific Fleet was reorganised in June. Task Force 44 was allocated to Australian and New Zealand waters including the New Guinea area, with Australian cruisers "Australia", "Canberra" and "Hobart", and the American "Chicago" under Rear-Adm V. A. C. Crutchley RN. Until the arrival of the British Pacific Fleet in early 1945, Australian and New Zealand ships were almost the only representatives of the White Ensign in the Pacific. Papua, New Guinea - After failing to took Port Moresby by sea at the time of the Battle of the Coral Sea, the Japanese planned to land on the north coast at Buna and Gona and advance overland by way of the Kokoda Trail. They landed on the 21st and moved south, just as the Australians were preparing to defend Kokoda itself and push north on Buna. The Japanese captured Kokoda on the 29th, and throughout August slowly pushed the Australians back south towards Port Moresby. Guadalcanal (step-too-far 3), British Solomon Islands - The Japanese were now extending their hold in the southern Solomons and building an airfield on the island of Guadalcanal. From there they could move against the New Hebrides, New Caledonia and other islands along the supply routes to Australia and New Zealand. After the Japanese presence was discovered, the US 1st Marine Division was landed on the 7th, soon capturing the airstrip which was renamed Henderson Field. Close cover was provided by a force of American and Australian cruisers. 9th - Battle of Savo Island - In the early hours of the 9th a Japanese force of seven cruisers and a destroyer headed for Savo Island to the north of Guadalcanal to get at the US transports. Instead they stumbled on five patrolling cruisers. Taken completely by surprise, Australian heavy cruiser "CANBERRA" and the American "ASTORIA", "QUINCY" and "VINCENNES" were hit by a torrent of gunfire and torpedoes, and sank in an area soon known as lronbottom Sound. The fifth cruiser "Chicago" escaped and Australian cruisers "Australia" and "Hobart" were close by but took no part in the action. The transports were untouched. From now on, as both American and Japanese forces tried to bring in supplies and reinforcements, numerous naval battles were fought in and around the southern Solomons. Battle of the Eastern Solomons - On the 24th, Japanese and American carrier groups covering supply operations to Guadalcanal were in action to the east of the Solomons island chain. Japanese light carrier on "RYUJO" was sunk and the American "Enterprise" damaged. From now on, the Japanese relied increasingly on 'Tokyo Express' destroyers to bring in supplies by night down 'The Slot' - the waters between the islands of the Solomons. Papua, New Guinea - In their move on Port Moresby, Japanese troops landed at Milne Bay at the extreme southeast tip of Papua on the 25th. The mainly Australian resistance was strong and by the 30th, the invaders were starting to evacuate. By early September they had gone - the first major setback Japanese forces have experienced on land. Papua, New Guinea - In mid-month the Japanese reached their furthest point down the Kokoda Trail, within 30 miles of Port Moresby. Australian troops now went over to the attack and slowly drove north towards Kokoda. Guadalcanal, British Solomon Islands - As the two sides struggled to build up their forces, more fighting took place for possession of Henderson Field. An old friend of the Royal Navy and Malta was lost when US carrier "WASP" was torpedoed by submarine "I-19" on the 15th, yet another casualty of the attempts to reinforce the island. Only carrier "Hornet" remained operational in the South Pacific, but she was joined by the repaired "Enterprise" in October. British Gilbert Islands - After a brief stay in December 1941, Japanese forces reoccupied and start fortifying the atoll of Tarawa. Papua, New Guinea - The Australians continued to push up the Kokoda Trail against the usual bloody Japanese resistance. US troops took a parallel track to reach the coast south of Buna. Allied landings also took place on the north coast up from Milne Bay in preparation for the coming assault on Buna and Gona. Guadalcanal, Solomon Islands - As the struggle carried on for the island's one airfield, supply and support operations led to two more major naval battles: Battle of Cape Esperance - Off the north tip of Guadalcanal on the night of the 11th/12th, a US cruiser force was in action with a similar Japanese force. Both sides lost a destroyer, and the Japanese a heavy cruiser. Battle of Santa Cruz - From Truk, a large Japanese carrier and battleship task force approached the southern Solomons to support a major land attack on Henderson Field. On the 26th they were in action with a much smaller US carrier group north of the Santa Cruz Islands. "HORNET" was lost and "Enterprise" put out of action in exchange for heavy damage to the carrier "Shokaku". The damaged "Enterprise" was now the only US carrier in the South Pacific. Adm King, US Navy Commander-in-Chief, asked for the loan of a fleet carrier from the Royal Navy. Anglo-US relations were strained when problems arose about the need to re-equip with US aircraft, but "Victorious" was ordered out in December. Papua, New Guinea - Kokoda was captured on the 2nd, and by mid-month Australian and American troops were attacking the strongly fortified positions around Buna and Gona. Fierce fighting carried on throughout November and December. Guadalcanal, Solomon Islands - Three more naval battles took place as US forces started to push the Japanese away from the airfield towards Cape Esperance. First Battle of Guadalcanal - On the night of the 12th/13th a large Japanese troop convoy approached accompanied by two battleships which were to bombard Henderson Field. A US cruiser force set out to meet them in lronbottom Sound. They lost two cruisers and four destroyers, and the Japanese two destroyers in the fighting. Also Japanese battleship "HIEI" was disabled by gunfire and later finished off by US torpedo aircraft attack. Second Battle of Guadalcanal - Two nights later the Japanese again tried to bring in troop transports. This time a battleship action resulted and "KIRISHIMA" was sunk by the "Washington". Battle of Tassafaronga - On the 30th in the same area, an eight-destroyer 'Tokyo Express' was intercepted by US cruisers and destroyers. One of the Japanese was sunk but at the cost of one cruiser lost and three severely damaged as the 24in Long Lance torpedoes tore through the US lines. Guadalcanal, Solomon Islands - After four months struggle, the US 1st Marine Division was relieved by the Army. Japanese destroyers continued to run in supplies by nightly 'Tokyo Express', but by the end of the month High Command in Tokyo had decided to evacuate its troops. Meanwhile US forces pushed west from Henderson Field.